I am obsessed with mug food right now. Completely and utterly obsessed. Not like, cup o’ soups or mug shots, but the sweet treat desserts and quick fix meals that are perfect for the wintery months. I’ve trawled the internet for recipe after recipe, trying out the ones I especially liked the look of, with a couple of explosions and outright disasters along the way. What? Nobody’s perfect. But! Despite having to clean my microwave more regularly than I’ve ever had to do before, I have found some smashing recipes. Super moist, super tasty, and above all, super easy. Hardly any prep time and cooked in a few short minutes. In a microwave. No waiting around or preheating your ovens! Baked goods if you don’t have an oven! Could I be using any more exclamation marks right now!? 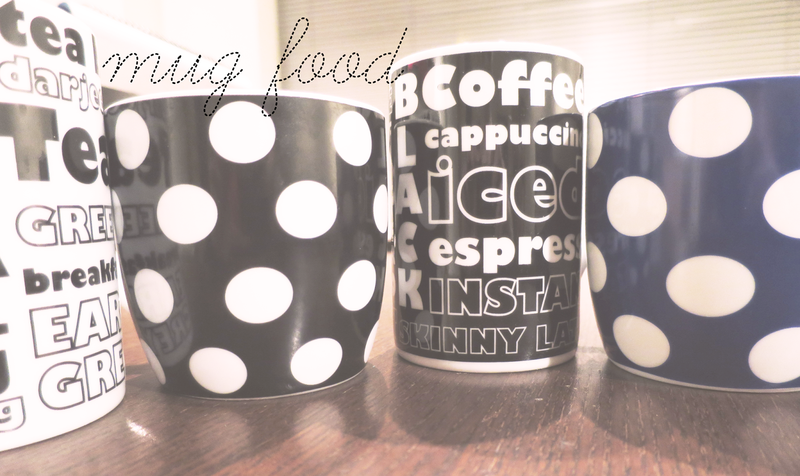 If you’re a student like me, want a quick fix mid-essay, or have just got back from a full day of lectures and the thought of cooking makes you want to curl up and cry (because we’re all too poor for a takeaway), then mug food is the answer. They can be adapted to work for a range of diets too, plus you can mix up the ‘extra’ ingredients around the base for variety. Basically mug food is life. Provided you’re not eating it as a substitute for meals with actual veg and protein and stuff, ’cause that wouldn’t be clever. My go-to recipe is ‘The Moistest Very Vanilla Mug Cake‘ by Table for Two. A lot of the time I substitute the vanilla flavouring for cocoa powder, matcha, or, most usually, cinnamon. Gotta love a bit of cinnamon when the weather gets cold. I was lucky enough for my friend to gift me the most adorable set of Hello Kitty measuring cups for my 21st, so I don’t have to convert cups to grams anymore – makes recipe hunting so much easier. 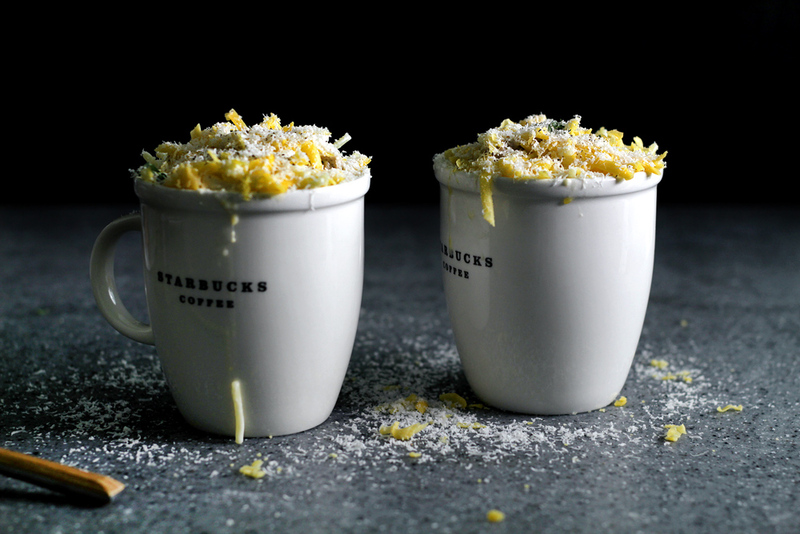 For those of you that don’t work in cups, I’ve added the grams to the ingredients. 2 tbsp. / 30g butter, melted. In another bowl or measuring cup, combine milk, vanilla bean paste + vanilla extract, if not then skip this step! Mix until the batter is smooth and well combined – no lumps! Carefully remove from the microwave and enjoy! Depending on what’s in my kitchen already, or the flavour of the cake, I’ll add fresh fruit, yoghurt or cream. I love the taste of cinnamon and banana, so I’ll reach for that most often. With chocolate it has to be cream, with vanilla I like strawberry or cherry yoghurt, and matcha I like with citrus flavours. For an actual time pressed meal, not just cake, this recipe from lady and pups is ace. I didn’t take any photos when I made it with the turkey mince I’ve had sitting in my freezer for a bit, so the image above is taken from her blogpost with the recipe, but it tastes so goooood and is so waaaaaarm and cheesy. Seriously hits the spot, and is a great use for pasta if you’re wanting to spruce things up a bit. Or convince your parents you can cook. Do you have any favourite mug recipes? SortedFood did a pretty great series with a bunch of equally great recipes I am dying to try. What do you think? "Blogmas day 4: My Ultimate Xmas Wishlist"